It’s time for our yearly holiday chord melody arrangement! I was going through some notes with a long time student and I came across a nice arrangement of Silver Bells that I had done years ago.The nice thing about this arrangement is that it sounds lovely, but is also quite manageable for the fingers. It only has two “up-the-neck” chords! As you may know, chord melody is a style of playing that allows us to play chords and melody at the same time. It’s my favourite thing to do on the uke! In order to combine the chords and melody in a song it is often necessary to play chords in ways that we are less familiar with. Let me give you an example. But did you know that G7 can also be played like this? 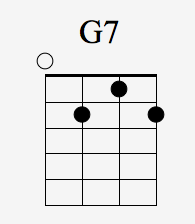 Please practice playing these two versions of G7 until you are familiar with both of them. 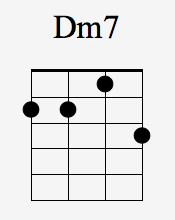 Again, please practice these two versions of the Dm7, until you become familiar with them. I call these new versions of chords “up-the-neck” chords because they are found on the higher frets of the uke. You may also hear them referred to as “inversions” or “voicings”. This brings me to some exciting news! My next book will be a lesson-a-day approach to learning chord shapes up the neck. I am working hard on it and hope to have it out soon. Time for our arrangement! Here is a video of me playing through Silver Bells. 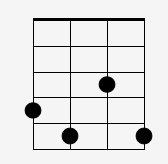 Can you spot where I use the new chord shapes in today’s lesson? You’ll also find the tablature below. The song sheet has the melody in standard notation and tablature as well as the chords and words, so you can practice singing the song. 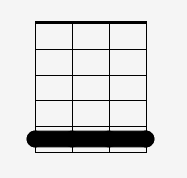 The chord melody arrangement is on its own separate line. Enjoy! That’s all for today’s lesson. I hope you enjoyed the chord melody! All the best in your playing. ← UD#81 Where Do The Melodies Live?